A still from "A Wrinkle in Time" (2018). Warning: This review contains spoilers for "A Wrinkle in Time." "A Wrinkle in Time," which opens in theaters today (March 9), is the perfect film to show kids applications of science, technology, engineering and math (STEM). Murry used to be an involved father with his two children, Meg (Storm Reid, "12 Years a Slave") and Charles Wallace (Deric McCabe, making his first major appearance). His love of science shows in the kids — they have big vocabularies and easily talk about physics and fractals. But Meg is now struggling in school; she's teased by classmates and her marks are slipping, to the despair of their mother, Mrs. Murry (Gugu Mbatha-Raw, "Black Mirror" and "Beauty and the Beast"). Then the precocious Charles Wallace makes friends with several mysterious adult women: Mrs. Which (Oprah Winfrey), Mrs. Whatsit (Reese Witherspoon) and Mrs. Who (Mindy Kaling). The women turn out to be powerful beings, able to transport between worlds in the universe. Mr. Murry appears to be trapped on one of those distant worlds. They pledge to help Meg and Charles Wallace find their missing father, and take along classmate Calvin (Levi Miller, "Pan") for the journey. You'll see a couple of cameos from other famous actors later in the film, including somebody from "The Martian." Keep your eye out; each of the encounters is memorable. 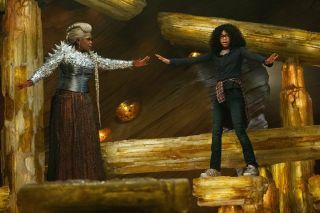 In "A Wrinkle in Time" (2018), three mysterious women help children travel through space to rescue their father. In the film, Mr. Murry says tessering exploits the connection between tiny particles linked by quantum mechanics. The particles are still connected while spread widely apart, at different sides of a galaxy. By tapping into the right frequency, he explains, one can jump between locations in space and move very quickly. The scientists laugh at his explanation. Later, at their house, Mrs. Murry urges Mr. Murry to slow down his explanations to give time for others to catch up and verify. But he disappears before they have the chance to try again. Meg inherits her love of science from her father. At one point in the movie, she finds a creative way of using a catapult. Calvin asks her how she was able to do it; when she explains she used physics, he is astounded. Meg also uses science to find her way out of a closed-off room, but we'll let you watch the movie to see her creative solution. Let's just say it's a feat of special effects. Children play outside in an ominous suburb in "A Wrinkle in Time" (2018). Some movie reviews have complained about the plot, which is (admittedly) a little simplistic and slow at times. But we have to remember that this is a children's film. Themes will be simplified. The actors will stop at times to simply play. There is a moral message embedded in the film about embracing your true identity; this theme is repeated several times and very obviously. Many adults will probably hate this stuff. Your 8-year-old, however, will likely enjoy it. One beautiful surprise for adults and children alike is the diversity of the cast — and how nobody even makes a big deal of it. A simple walk around Meg and Charles Wallace's neighborhood shows people of several cultural backgrounds living there. The three beings Meg and Charles Wallace travel with are also racially diverse. Director Ava DuVernay deliberately made Meg different from the book, too; the book portrays Meg as a white child with red hair, but DuVernay cast Reid, a young African-American actor, along with African-American actor Mbatha-Raw for her mother. Readers of "A Wrinkle in Time" will notice several deviations from the book. Most of them appeared to be scenes added for dramatic effect, such as when the children are running away from something that looks a bit like a tornado. The book also has more siblings in the Murry household, but as they played only a minor role in the book, their absence wasn't a problem. But some of the classic scenes are still there, including that creepy one involving children bouncing balls. The movie is an excellent effort at interpreting the 1962 book for a newer audience. The actors' strong performances and the impressive special effects make it worth watching for the adults, even if the plot isn't necessarily as quick-witted or as funny as other recent space-themed films. By the way, if you do see it in a theater, splurge for the 3D effects. I saw it in 3D during my review and I felt, given the strong computer graphics, the extra money was worth it.